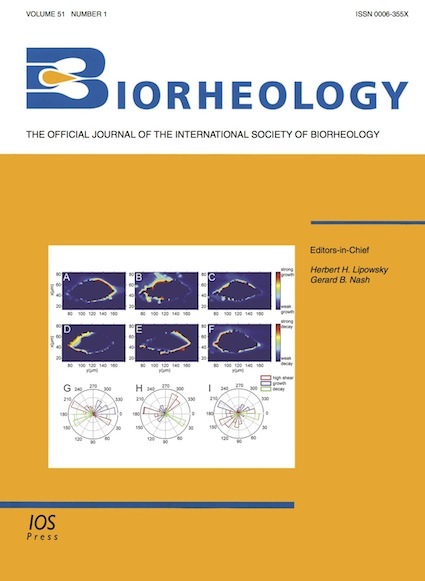 IOS Press is celebrating 50 years of Biorheology! Please read the Editorial on how it all began and enjoy the article A viscoelastic model of shear-induced hemolysis in laminar flow free of charge. Authors should submit names and addresses of up to three reviewers for their paper. The Editor-in-Chief will review Letters to the Editor. 1) Full length articles. These are reports of original research and have an abstract. 2) Brief Communications. These are short, often preliminary, reports of new research. They should have an abstract and should not exceed 6 journal pages. 3) Review articles. Up-to-date accounts on the state of subjects of interest to the journal. 4) Letters to the Editor. These should be concerned with matters of opinion or critiques of interest to the scientific community in biorheology and related fields. They should not exceed 2 pages. In addition to the above, reports and abstracts from scientific meetings, review articles, and book reviews are published upon invitation by, or request to, the Editor-in-Chief. (All scientific communications are to follow the same format and layout). Biorheology also publishes news items. Biorheology is published in English. Authors whose mother tongue is not English are urged to make sure that the text as submitted communicates their intent accurately. Authors who are unsure of acceptable English usage should have their manuscript checked by someone proficient in the English language. Manuscripts lacking clarity will be returned to the author for rewriting before being sent for review. International Science Editing offers a language and copy-editing service to all scientists who want to publish their manuscript in scientific peer-reviewed periodicals and books. Manuscripts should be typed double-spaced throughout on one side of the paper only, in 12 point Times New Roman font, and must be numbered beginning with the title page. For the electronic file of the text a standard word processor file such as Word or LaTex should be used (if using LaTex, please use the standard Article.sty as style), and when submitting on line, send a pdf file as well. Major headings (Introduction, Experimental, Methods, Results etc.) are numbered 1, 2, 3… and in boldface (but not capitalized), aligned with the left hand margin. Secondary headings should be in italics aligned with the left hand margin, numbered, e.g. 2.1., 2.2., 2.3. etc. The text then resumes on the next line, and, as is the case for every new paragraph, is indented by 0.19 inches (= 4.9 mm). Similarly for tertiary headings numbered, e.g. 2.1.1., 2.1.2. etc. The title page should contain the title of the paper, authors, laboratory or institution of origin with city and country, but no postal codes etc. The corresponding author should be marked with an asterisk referring to a footnote which should give a complete mailing address, a fax number and an e-mail address. The title page must also have a short running head, which does not exceed fifty characters, and 4-6 key words, not including words in the title of the paper. Each paper submitted must be accompanied by an abstract which does not exceed 200 words. It should state concisely the reason for the study, what was done, what was found, what was concluded, and the relevance of the work. Tables are numbered consecutively with Arabic numerals. Tables should be typed as text (do not use graphics programs), double-spaced on separate pages and placed at the end of the manuscript. Each table should have a brief title and sufficient information in its legend so that it is understandable without reference to the text. Each column should have a short or abbreviated heading. Do not use internal horizontal or vertical rules. Explanatory matter should be in footnotes in which nonstandard abbreviations, statistical measures of variations (standard deviation and standard error of the mean) should be identified. Each figure should be provided on a separate page; figures should not be included in the text. Original drawings (no photocopies) are required. Electronic versions of the figures should be supplied in either Encapsulated PostScript (EPS), TIFF or PDF format. For vector graphics, EPS is the preferred format and files should always include the fonts that were used. For bitmapped graphics, TIFF is the preferred format. Other formats e.g. JPEG, PiCT or WMF, cannot be used. Line weights should not be less than 0.35 point. PDF files should be not less than 300 dpi (halftones) and 600 dpi (lineart or combined) resolution, and files should include fonts that were used. Artwork prepared using a microsoft office application should have minimum of 300 dpi (halftones), 600 dpi (lineart), 500 dpi (combined) resolution. One should avoid enlarging or reducing images after placing them in a Microsoft Office application. Letters, numbers and symbols must be clear and large enough so that, when reduced for publication, they will remain legible. If the legend refers to panels “a”, “b”, etc., the figure must be labeled accordingly. Figures should be saved in separate files without their legends (captions). Legends should be included in the text of the article on a separate page(s) for each figure and should be sufficient to make the figure understood without reference to the text. Figures should be kept to a minimum, and the author(s) may be instructed to reduce the number submitted if the Editor conducting the review judges this desirable. Color figures: Color figures can be included, provided the cost of their reproduction is paid for by the author. This journal publishes all its articles in the IOS Press Pre-Press module. By publishing articles ahead of print the latest research can be accessed much quicker. The pre-press articles are the uncorrected proof versions of the article and are published online shortly after the proof is created. At the same time, the pre-press articles are indexed by PubMed where they appear as [Epub ahead of print]. Pre-press articles are fully citable by using the DOI number. A PDF file of the page proofs of the article will be e-mailed to the corresponding author. These proofs must be corrected and returned with a completed reprint order form to VTEX, Vilnius, Lithuania: editorial@vtex.lt . Corrections other than printer errors should be avoided as much as possible. Costs arising from such corrections will be charged to the authors. The corresponding author of a contribution to the journal will receive a complimentary PDF Author’s Copy of the article, unless otherwise stated. This PDF Author’s Copy is watermarked and for personal use only. A free PDF copy will not be provided for conference proceedings and abstract issues. An order form for a PDF file without watermark, reprints or journal hard copies will be provided along with the PDF proof. When human subjects are used in research, manuscripts must contain a statement that the experiments were undertaken with the understanding and written or verbal consent of each subject according to the conditions set forth by a Human Subjects or Ethics Review Board, and that the study conforms with The Code of Ethics of the World Medical Association (Declaration of Helsinki) printed in the British Medical Journal issue of July 18, 1964 (see also the basic principles below). When experimental animals are used, manuscripts must briefly but explicitly state that measures were taken to minimize pain or discomfort, e.g. type and dose of anesthetic used and that experiments were carried out with the approval of an Animal Protection Committee in accordance with the guidelines laid down by the NIH in the US regarding the care and use of animals for experimental procedures. 2. The design and performance of each experimental procedure involving human subjects should be clearly formulated in an experimental protocol which should be transmitted to a specially appointed independent committee for consideration, comment and guidance. 5. Every biomedical research project involving human subjects should be preceded by careful assessment of predictable risks in comparison with foreseeable benefits to the subject or to others. Concern for the interests of the subject must always prevail over the interests of science and society. 6. The right of the research subject to safeguard his or her integrity must always be respected. Every precaution should be taken to respect the privacy of the subject and to minimize the impact of the study on the subject's physical and mental integrity and on the personality of the subject. 9. In any research on human beings, each potential subject must be adequately informed of the aims, methods, anticipated benefits and potential hazards of the study and the discomfort it may entail. He or she should be informed that he or she is at liberty to abstain from participation in the study and that he or she is free to withdraw visor her consent to participation at any time. The physician should then obtain the subject's freely given informed consent, preferably inheriting. 10. When obtaining informed consent for the research project the physician should be particularly cautious if the subject is in dependent relationship to him or her or may consent under duress. In that case the informed consent should be obtained by a physician who isn't engaged in the investigation and who is completely independent of this official relationship. 11. In case of legal incompetence, informed consent should be obtained from the legal guardian in accordance with national legislation. Where physical or mental incapacity makes it impossible to obtain informed consent, or when the subject is a minor, permission from the responsible relative replaces that of the subject in accordance with national legislation. Whenever the minor child is in fact able to give a consent, the minor's consent must be obtained in addition to the consent of the minor's legal guardian. 1. In the treatment of the sick person, the physician must be free to use a new diagnostic and therapeutic measure, if in his or her judgment it offers hope of saving life, re-establishing health or alleviating suffering. 2. The potential benefits, hazards and discomfort of a new method should be weighed against the advantages of the best current diagnostic and therapeutic methods. 3. In any medical study, every patient- including those of a control group, if any- should be assured of the best proven diagnostic and therapeutic method. 5. If the physician considers it essential not to obtain informed consent, the specific reasons for this proposal should be stated in the experimental protocol for transmission to the independent committee (1, 2). 6. The physician can combine medical research with professional care, the objective being the acquisition of new medical knowledge,only to the extent that medical research is justified by its potential diagnostic or therapeutic value for the patient. 1. In the purely scientific application of medical research carried out on a human being, it is the duty of the physician to remain the protector of the life and health of that person on whom biomedical research is being carried out. 2. The subjects should be volunteers- either healthy persons or patients for whom the experimental design is not related to the patient's illness. 3. The investigator or the investigating team should discontinue the research if in his/her or their judgment it may, if continued, be harmful to the individual. 4. In research on man, the interest of science and society should never take precedence over considerations related to the well-being of the subject.